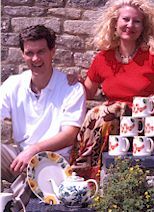 Aston Pottery was founded in 1990 by Jane and Stephen Baughan with the criteria to design and produce a range of kitchen, gift and tableware which can be used every day. Today they employ 25 people producing over 120 different patterns on 45 different shapes. All the ware is dishwasher proof and microwave safe. 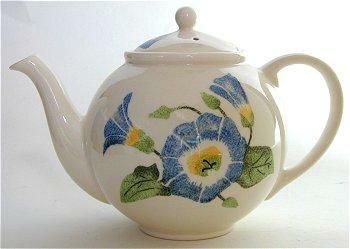 Aston Pottery has elevated the principle of the cottage industry to modern levels of professionalism. A complex of four period farm buildings at Kingsway Farm, Aston in Oxfordshire have been extensively renovated to provide an efficient and modern working environment for their staff and visitors, with the whole production process from concept to completion taking place on-site. For the manufacture of the ware they employ traditional methods of slip-casting, jiggering and jollying. Careful attention is given to the quality of the raw materials and exacting production standards that will maintain the high level of finish the product demands. 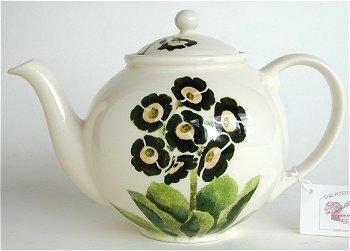 Two pint hand decorated teapot.